According to a 2018 Northwestern Mutual survey, 78% of Americans say they are concerned about not having enough saved for retirement. What’s more, 66% believe they will run out of their retirement funds while they are still alive. Those statistics suggest that many Americans will increasingly find themselves relying on Social Security into their old age. Not all seniors, though, are uniformly reliant on Social Security. Below, we look at where seniors are most dependent on Social Security. To rank the places where seniors rely on Social Security the most, we compare two factors. Specifically, we examine total retirement income and compare it to Social Security income. Check out our data and methodology below to see where we got our data and how we put it together to create our final rankings. Social Security is very important to seniors’ budgets - The Social Security Administration estimates that 21% of married couples receiving Social Security benefits rely on it for more than 90% of their income. Across the 100 cities we analyzed, Social Security benefits made up 42% of retirement income on average. Social Security income is less dominant in high-cost-of-living areas - The cities where Social Security makes up the smallest portion of retirement income tend to be high-cost-of-living cities. The last-ranked city is Washington, D.C., in 98th is Oakland and Los Angeles takes 90th. San Francisco and Boston take 89th and 88th, respectively. 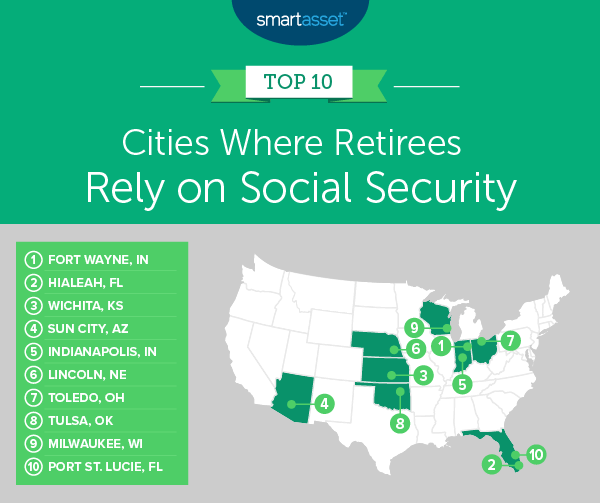 Topping the charts of where retirees are most dependent on Social Security is Fort Wayne. In this city, average Social Security income equals $21,247, while total average retirement income equals $39,500. That means Social Security equals roughly 54% of income for the average retiree. The good news for the nearly 35,100 seniors in the area is the cost of living in Fort Wayne is relatively low. Florida is a great state for retirees. The weather is warm year-round, and there are plenty of other seniors with whom to socialize. On the financial side, Florida does not tax retirement income of any kind, including Social Security income. That makes it a reasonable place to retire while relying on Social Security. Our data shows that 53.6% of retirement income comes from Social Security for seniors. Our analysis of Census Bureau data shows that average Social Security income equals slightly more than $21,000 per year in Wichita. Average private retirement income here equals $20,600. Combining these two figures, we see Social Security income is worth more than 50% of a retiree’s income. Some data suggests seniors here look to supplement their income with work. More than 35% report earnings from work. 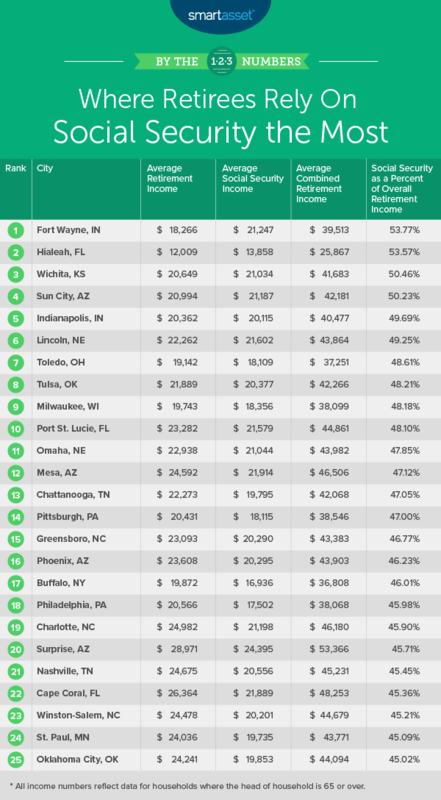 Sun City is the fourth-ranked city and the last on our list where Social Security makes up a majority of retirement income. Specifically, of the average $42,181 in yearly total retirement income, $21,187 comes from Social Security here. Sun City is a reasonable place to retire if you are relying on Social Security given that Arizona does not tax Social Security income. If you are dead-set on the Phoenix metro area and its environs, Sun City is also a good place to land. The cost of homes here is lower than the metro-area average. Data from the Census Bureau shows that there are nearly 100,000 seniors in Indianapolis. On average, Social Security income falls just short of private retirement income. Specifically, average annual Social Security income equals $20,115, while average private retirement income equals $20,362 a year. Lincoln is one of the best state capitals to live in and a city with a great work-life balance. But despite the employment opportunities here, seniors who stay in Lincoln tend to rely on Social Security to cover their expenses. This is also a pretty forgiving locale if you find yourself without a ton of retirement income. It is a fairly affordable city with ample work opportunities. On the other hand, Nebraska does tax Social Security income. Overall, Social Security income is equal to 49.2% of retirement income. The average 65-and-older Toledo household with private retirement income takes in about $19,142 annually, while average Social Security income equals $18,109 a year here. That leaves Social Security equaling 48.6% of retirement income in Toledo. Residents of Ohio relying on Social Security will appreciate how friendly Ohio is to retirees. The state does not tax Social Security income. On average, Social Security is worth 48.6% of income in Tulsa. This city has the lowest combined retirement income in our study at $37,251. Fortunately, Tulsa is an affordable city. Only about 24% of seniors here spend 30% or more of their income on housing, and nearly 70% of seniors own their homes. Milwaukee is another relatively affordable big city where seniors rely on Social Security income to fund their retirements. The average $18,356 in annual Social Security income equals 48.2% of annual income for the average senior household. Finishing off the top 10 is Port St. Lucie, another Florida city. In Port St. Lucie, slightly more than 48% of retirement income comes from Social Security. Despite seniors’ reliance on Social Security here, their economic situation may not be so bleak. Nearly 87% own their home, which can act as a form of insurance in case they need extra funding in their golden years. Average retirement income for senior households. This is all income that comes from pension plans, periodic income from annuities or insurance and income from IRA plans. Data is for households where the head of household is 65 or older and comes from the U.S. Census Bureau’s 2017 5-year American Community Survey. Average Social Security income for senior households. This includes Social Security pensions and survivor benefits and permanent disability insurance payments that the Social Security Administration makes. Data is for households where the head of the household is 65 or older and comes from the U.S. Census Bureau’s 2017 5-year American Community Survey. We combined the two income metrics to create one overall retirement income metric. Then, we divided the average Social Security income by overall retirement income. This showed what percent of total retirement income was coming from Social Security. We then ranked the cities from highest to lowest. Take advantage of compound interest - Consistently investing early will allow your retirement portfolio to grow on its own. As it picks up steam, it will continue to see the same average returns, but those average returns will be worth more. Talk to an advisor - There are a number of different strategies people use to retire. Some keep a strict budget, invest aggressively and retire early, and others plan for a fairly late retirement with relatively modest savings plan. Whatever your current approach, it is probably a good idea to talk to a financial advisor. Such an expert can make sure you are on pace to retire with enough to live a stress-free retirement. If you are not sure where to find a financial advisor, check out SmartAsset’s financial advisor matching tool.